Select the appropriate page for your version from the chart below. Note that the “from” and “to” fields are inclusive. 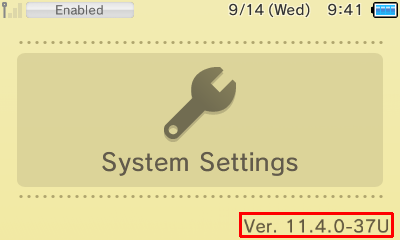 This means that, for example, the “from 9.0.0 to 9.2.0” row includes 9.0.0, 9.1.0, and 9.2.0. Additionally, note that the last two columns of the chart refer to the last number of your version (which corresponds to the browser version installed to the system). If the version is -0 then you do not have a browser, while any number above -0 indicates a browser is installed. In the case of “5.0.0-0U” for example, you would follow the “No Browser” column and 5.0.0 to 5.1.0 row because the system is on the a system version in that range and has no browser installed. Your device version can be found at the bottom right of the top screen of the System Settings. If you have already hacked your 3DS before and have an EmuNAND based CFW setup, just follow all instructions while on SysNAND. Replace any files that already exist. Your data will be transferred from EmuNAND to your new B9S install at the end. If you use menuhax, you should clear Home Menu’s extdata to remove it before beginning. This page is for instructions on how to install boot9strap to a stock 3DS or 2DS. If you already have arm9loaderhax installed and are looking to update to boot9strap, follow A9LH to B9S.